It was a message in a bottle from the land of irrelevance. 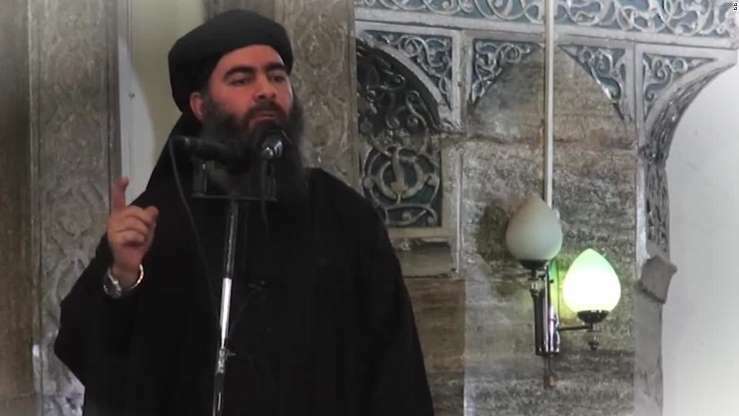 Abu Bakr al-Baghdadi, the self-appointed caliph of the Islamic State of Iraq and Syria (ISIS), this week purportedly put out a voice recording to his dwindling flock of followers, exhorting them to carry on a fight they've already lost. At the height of ISIS' power in 2014, the group controlled a quasi-state roughly the size of Britain, including Mosul, Iraq's second largest city, and Raqqa, its de facto capital, in Syria. Since then it has lost more than 90% of that territory and today holds sway over pockets of remote terrain straddling the two countries. In the audio message, titled "Give Glad Tidings to the Patient," Baghdadi downplayed the loss of territory and issued the usual calls for the overthrow of hostile Arab regimes. But as much as he might dismiss ISIS' losses, it's hard to imagine it ever recovering. The US Defense Department and the United Nations estimate that there are still as many as 30,000 ISIS fighters still on the loose in Syria and Iraq, and although the Iraqi government has declared victory over the group, loyalists continue to conduct hit-and-run attacks and probably will do so for the foreseeable future. Others who fight under its black banner are still present in parts of Africa, Afghanistan, the Philippines, and elsewhere. So-called "lone wolves" will continue to carry out attacks wherever and whenever they can in the land of the "Crusaders," as Baghdadi urged them in his message. The message did go some way to put to rest the persistent rumors that Baghdadi was either critically injured or dead. The United States, which places so much importance on the killing of figureheads (think Saddam Hussein and Osama bin Laden), would clearly like to savor another "we got him" moment. Not yet. Reacting to Baghdadi's message, Capt. William Urban of the US Central Command told CNN: "We do not know where Abu Bakr al-Baghdadi is at this time, but he continues to be someone that we are interested in removing from the battlefield." News of Baghdadi's 55-minute address spread quickly late Wednesday evening here in the Middle East, but it came out in a week when the sea of scandals in the US was rising to tsunami levels, and few took notice. The ISIS that seized Mosul in a single day in June 2014, that made it to the outskirts of Baghdad, that for a brief moment seemed unstoppable, is a thing of the past. The chapter that history will dedicate to ISIS will be a relatively slim one. Not so the chapter that follows. A historic shift is afoot in the Middle East, not one as attention-grabbing as ISIS' brief, bloody reign, but one that is reshaping alliances in the region. Russia's influence continues to expand, while American influence fades. Moscow intervened in Syria to save Bashar al-Assad in 2015, and since then it has filled a vacuum, charting the course for a post-war Syria (and no doubt hoping for a big slice of the reconstruction pie), serving as an intermediary between Israel and Iran, deepening its ties with key regional players, Turkey and Iran, and romancing Saudi Arabia's erratic Crown Prince Mohammed bin Salman. The Russians speak to everyone in the Middle East. Meanwhile the United States, weary of never-ending wars in Afghanistan and Iraq and consumed by a hallucinatory domestic drama, is barely paying attention. Yes, the Trump administration has a Middle East policy of sorts, perhaps: continue to cozy up to Benjamin Netanyahu's Israel and dangle an elusive "Deal of the Century" in front of the Palestinians; coddle Saudi Arabia and sell its hundreds of billions of dollars in arms while ignoring the disaster that is its Yemen war; strangle Iran with sanctions -- the consequences be damned; and taunt a hyper-sensitive Turkey with tweets and a trade war. Few in the US will take notice of how all this plays out, however, given that they'll more likely be transfixed by the latest contortions in the White House. Baghdadi's message coincided with Eid al-Adha, the holiday that follows the hajj, the annual pilgrimage to the holy cities of Mecca and Madina. While he may be fading into irrelevance, the fertile ground upon which ISIS grew is still there. Today's regimes in the region are as repressive, venal, corrupt and incompetent as they were four years ago, and the emergence of ISIS under another name is a definite possibility. That might bring the US to focus once more on the myriad crises in the Middle East. But don't bet on it.